This is part one of a five-part series. For part two, click here. Welcome to Mitching 101, students. Today, we will learn how to play a fun game. The game is called "Mitching," because that is my brother's name; he is the co-creator of this game, and it is with him that this game was created and has traditionally been played. 1. Shoulder-surf your opponent's phone password. 2. When your opponent's phone is unattended, pick it up and unlock it. 3. Open Facebook, and announce to the world (as your opponent, with too-frequent assurances that the poster is, in fact, the owner of the Facebook account) that your opponent has soiled himself. That's it. It's a simple three-step process, with plenty of wiggle room for additions, gambits, and flourishes. I have done this to my opponent, for whom the game is named, a dozen times or so. On some occasions, he has gotten mad and deleted them immediately. On others, he hasn't noticed, and by the time he has, there are enough "likes" and comments that he has decided to leave it. More infrequently, I have been so proud of my literary prowess that I have begged him to leave them up. Definitely an early effort, what one might call "primitive Mitching." As the very first foray into the art form, it is only the most basic of Mitches. It lacks details, any poetic flair, or any real narrative. 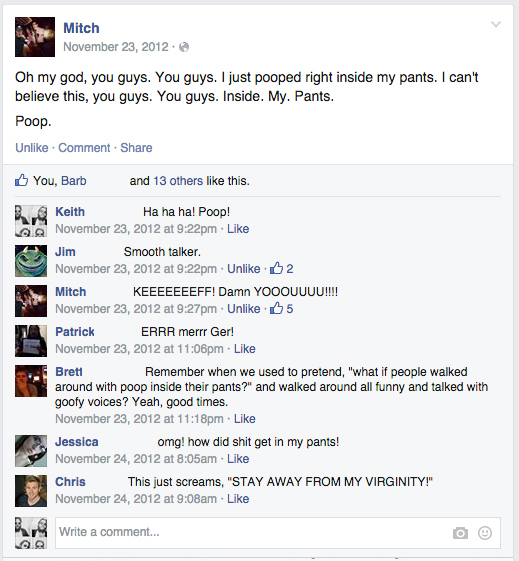 It was the first one, so I just tried to hammer out something embarrassing, while trying to make it absolutely clear that it wasn't actually Mitchell posting the status update. This is a very important portion of proper Mitching. Your goal here is for a person who knows your opponent well to read the post about the soiling, laugh, and know without a doubt that your opponent did not actually post the soiling status update. This was the one that he wanted to delete, but it had so many "likes" and comments that he decided that it should stay. So, there you have it: Basic Mitching. Tomorrow, we'll explore some advanced examples, some more sophisticated techniques, and provide some exercises. More lectures in this series:.